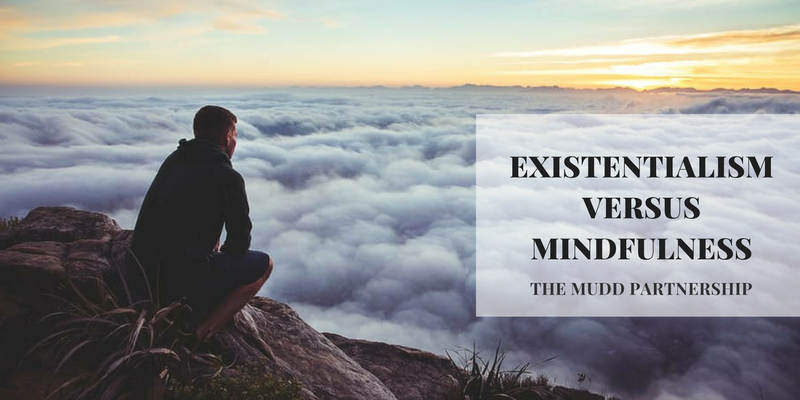 Existentialism Versus Mindfulness: Who Wins? The essence of Mindfulness is to be fully in the moment. The essence of Mindfulness is to be fully in the moment. To be present and pay full attention to that moment. To be fully aware and to know what is happening, while it is happening, no matter what. Jean Paul Sartre on the other hand, defines Existentialism simply as, “Existence preceding essence”. I take that to mean that having found myself thrown into the world, I go onto create my own definition (or nature, or essence) in a way that never happens with other life forms. Yet can I be defined, or labelled, if I am always a work in progress? Because as the Existentialists would have it I am creating myself constantly through action, always with the potential to be in constant motion and commotion, and this is fundamental to my human condition. Nonetheless, it is my consciousness and I am my own freedom, if I accept it, if I permit it: No more, No less! And Mindfulness allows me that acceptance and permission. Mindfulness also allows me to be fully human i.e. self-aware, able to understand complex emotions, &, have the capacity for empathy. “There are more things in heaven and earth, Horatio, than are ever dreamt of in our philosophy” (Hamlet, Folio 1, Act 1, Scene 5, William Shakespeare). Enlightened words are they not? I do not know what I do not know, but I cannot change that by worrying about the past, or fearing the future — therefore I Accept! The 18th century French Philosopher, Jean-Jacques Rousseau wrote, “(We) are born free, but are everywhere in chains”. Chains of our own making peut-etre’? Existentialism with its acknowledgment of constant motion and commotion through continuous acts of self-creation, proposes with it as we’ve already seen a fundamental truth and that is we are our own consciousness and our own freedom. So then we have the means to break free from our chains. If we choose. Whilst key to Mindfulness is an acceptance, and a kind compassion — for others, yes, most certainly, but also equally importantly, for oneself. And to accept things for what they are is not to give up on life. It is to embrace it and embody Socrates equally enlightened view, that the purpose of life is not just to live it, but to love the living of it! My book, ‘Uncovering Mindfulness: In Search Of A Life More Meaningful’ has ‘Uncovering’ in the title because I believe Mindfulness is within each of us to be uncovered by the simple act of living our lives in a Mindful way; with passion, with purpose, and with love. We are our own consciousness and our own freedom if we choose to accept it, but in Chapter Two in the book, I take this further. Suppose you were able to look through a gigantic, super powerful electron microscope. What would you see? In fact, what you thought was form and substance, shape and colour, would turn out to be almost emptiness; you would see patterns of subatomic particles as far apart as specks of stars in outer space: And if you looked at yourself, your body would have disappeared. Taking this further again, if you were then to look through a microscope with even more resolution, you would see that the so-called subatomic particles are actually not particles at all; they are concentrations, or as Neils Bohr describes them in the ‘Principle of Complementarity’, waves of energy without definite boundary. Known as wu in Chinese and kensho or satori in Japanese, this would be to view and be awakened to the cosmic reality that there is no boundary separating one subatomic particle from another. No boundary separating you from anyone, or anything else. In other words, from this viewpoint the whole universe is actually a continuous spread of energy or consciousness, without any differentiation and this is in part why I don’t think that Mindfulness and compassion, for example, are things to be discovered and developed — they are rather to be uncovered and given space and freedom, as they are already within each and every one of us. Joy and pain, happiness and sadness, they’re all within us, forming a common thread of both essence and existence. So, we need Mindfulness in our Existential world. And to the question, “Existentialism versus Mindfulness — Who wins?” Humanity — Good Ole’ Us! That’s what I’m saying — & No Contest!! Paul Mudd is the author of ‘Uncovering Mindfulness: In Search Of A Life More Meaningful’ available on Amazon and www.bookboon.com; the ‘Coffee & A Cup of Mindfulness’ and the ‘Mindful Hacks For Mindful Living & Mindful Working’ series. Through The Mudd Partnership works with business leaders, organisations and individuals in support of change, leadership excellence and introducing Mindfulness.